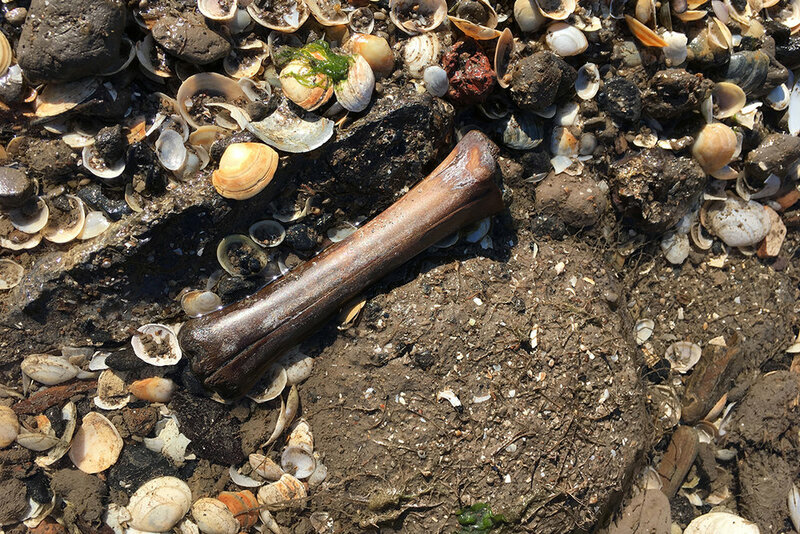 Getting down and dirty on the foreshore throws up Bronze Age bones! Over the past four days, a group of archaeology enthusiasts have been taking part in an excavation of Bronze Age artefacts (2300 BC to 750 BC) on the foreshore of the Severn Estuary at Peterstone, on the Wentlooge Levels. Bronze Age red deer antler. Led by Professor Martin Bell and his team from the University of Reading, the group have been learning how to search for, excavate and record archaeological artefacts as well as how to interpret the findings and what they can tell us about how people and wildlife lived and interacted during this time. For two days the group braved the intertidal mud, including some rather inclement weather on the first day and more than a few slips in the sticky mud! Their physical exertions were well worth it as they were able to source a number of important artefacts, which were brought back to Newport Medieval Ship Project on the final day of the course for cleaning, recording and processing. Their finds included worked wooden posts and a large number of animal bones, including a spectacular red deer antler that bore several cut marks and would almost certainly have been used as a tool during the Bronze Age. The star find was a rare piece of early Bronze Age Beaker pottery (c. 2300 BC to 1800 BC). The participants feedback about the event was overwhelmingly positive with everybody reporting that they had enjoyed the course and learned more about the heritage of the Gwent Levels. A report of the findings will be published in due course and we’ll provide a summary as soon as it is available, so check back for more information. Living Levels is planning a number of other archaeological activities and events over the next two years including GIS mapping and analysis, recording buildings, small-scale excavations and test-pitting. If you’d like to find out more, please email info@livinglevels.org.uk.